Simplify your approach to the gong fu tea ceremony. Go with my streamlined flow and you'll be serving gong fu cha in under 10 steps. The gong fu tea ceremony emerged in the Qing Dynasty (1644-1912). Gascoyne et al. note the earliest reference to the ceremony dates to early 17th century China. A paper by the O-Cha Tea Festival claims that the gong fu cha ceremony was developed specifically to prepare oolong tea. These two ideas about gong fu tea ceremony make sense in light of the fact that loose leaf was a Ming Dynasty (1368-1644) innovation. Much of my experiences with gong fu cha has been with oolong. Oolong (and of course, puerh) is ideally prepared in multiple short infusions, the essence of the gong fu tea ceremony. When I first witnessed a formal gong fu tea ceremony I found it quite complex. Honestly, I still find a proper gong fu tea ceremony intimidating. However, it is a beautiful process to watch and in which to participate. I've boiled down the ceremony to this gentle sequence. Gather your teaware and place them on a tray. Warm and cleanse your teapot with hot water. Pour out this water but don’t waste it. Cool it to room temperature to water your plants. Pour hot water into your sharing vessel. Pour this water into the drinking cups. Pour out excess water from the sharing vessel but don’t waste it. Pour water hot water (temperature appropriate for tea you are serving) unto the leaves in your teapot then put on the lid. Pour water over the lid and pot. While the leaves are steeping, discard the water in the drinking cups. Pour the liquor into the sharing vessel then pour the tea into the drinking cups. Repeat steps 5-6 until your tea leaves have been spent. 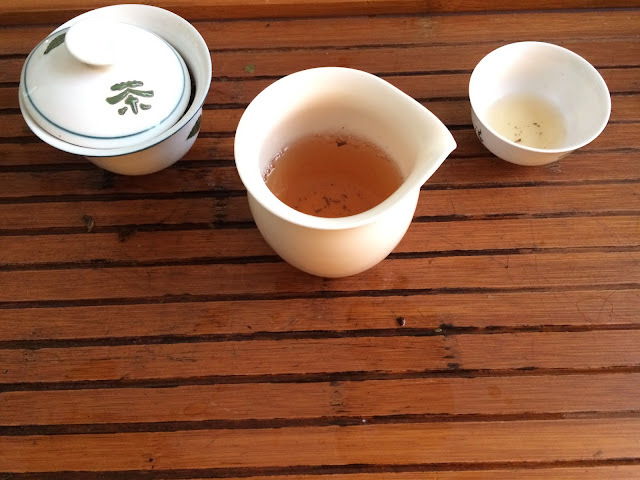 If you’d like to use a gaiwan to prepare your tea, read my post about How to Brew Puerh Tea. If you select a Taiwanese oolong, you may want to add an aroma cup to your gong fu tea ceremony to further appreciate the scents of the liquor. I'd love to hear about your experiences with gong fu tea -- share them in the comments. This review series brings you the books that have influenced some of my favorite tea book authors. Alexis Siemons is today's guest. Alexis is a tea consultant and writer, recipe developer, and photographer. Her latest publication is with tea journal ii. 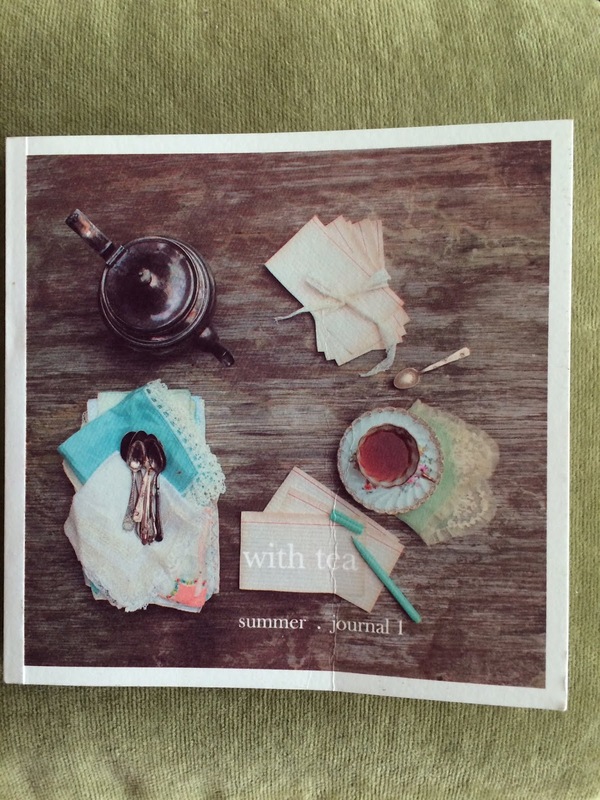 with tea journal 1 is part of my cookbook collection. It is an elegantly designed recipe book. The recipes were created for the summer season. The ingredients are seasonal such as basil, mint and peas. The sips are cooling. Even the savories are refreshing with the focus on jasmine green tea. Alexis opens the recipe book with a story of her relationship with cookbooks and markets. 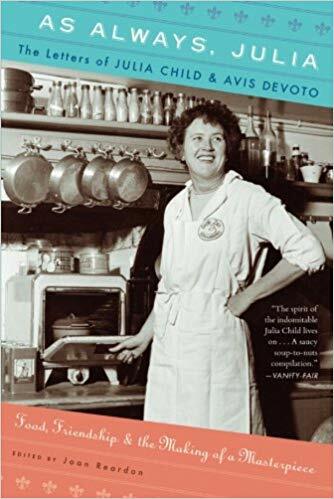 She writes about her approach to using tea in cooking: "Throughout the years, I have coaxed out astringent flavors to cut through the fat of a whipped heavy cream, sprinkled steeped leaves on fresh salads as an unexpected garnish, ground the dry leaves to whisk into breads alongside flour, and subbed it in for water to brighten up a standard grain of rice." The recipes in with tea journal 1 rely on many of these techniques. The meat of the cookbook isn't a dry set of instructions. Alexis peppers the journal with stories about individual ingredients or about her first taste of a particular dish. One of my favorite recipes by Alexis is not included in this journal. It is Lapsang Souchong Tea-smoked Pickled Cauliflower. These pickles are incredibly flavor. I highly recommend this recipe. Here are the writers and books that have influenced Alexis Siemons on her and tea and culinary journey. 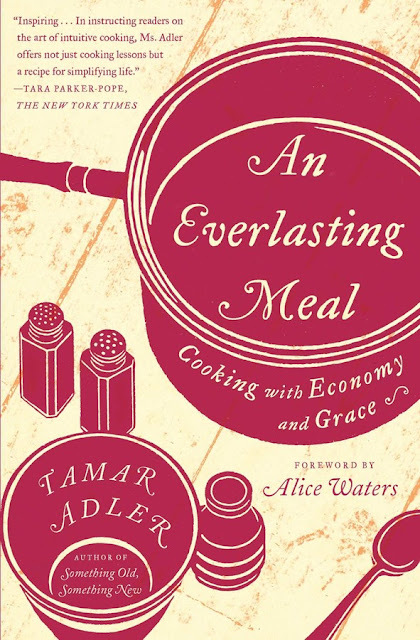 The style of this narrative cookbook inspired me to incorporate introductions to each recipe that lasted longer than a brief introductory headnote. She was also able to weave practical elements into such beautiful prose. All books by Ruth Reichl. Her tone and style of writing have always spoken directly to my soul. I have yet to find another writer who paints such alluring, evocative pictures that transport your state of mind and all of your senses. This book is quite influential for two reasons. One, I like to reach back in time to words from another era as I am an old soul. Two, as I worked to create two mini journals I was always inspired by the process/attention to detail that Julia had as she created her masterpiece. Thank you Alexis for sharing your writerly inspirations with us. What are the books that have influenced your tea journey? Share them in the comments. 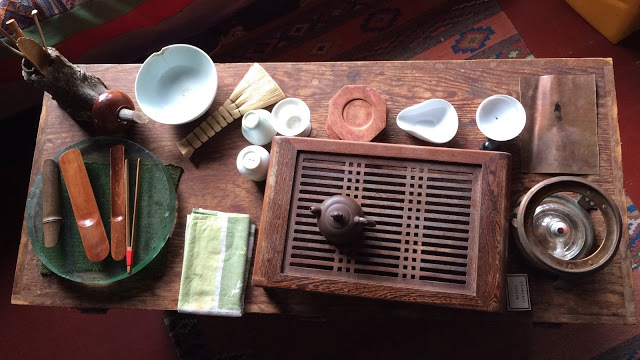 I am having so much fun writing about tea preparation! So far I've shared a post about brewing shou puerh in a gaiwan and steeping Darjeeling in a professional cupping set. 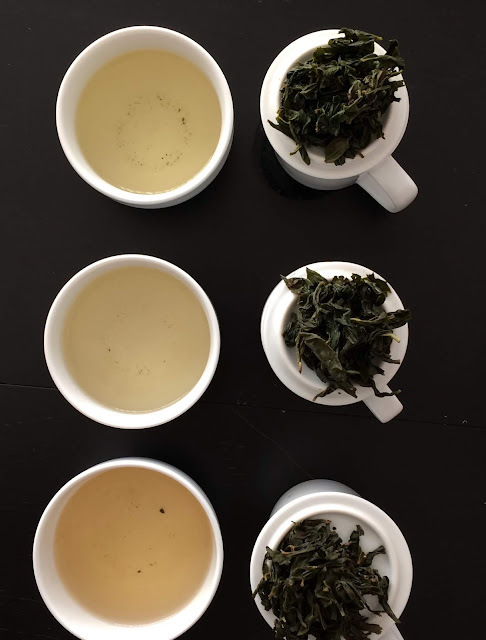 Today's post features the professional cupping set again but this time I used the tea cupping set to compare three Wenshan Baozhong oolong teas. The Wenshan Baozhongs are courtesy of Tillerman Tea: Wenshan Bao Zhong Winter 2018 (farmer Weng Wan Dashi), Spring 2018 (Wong One Dashi), and Spring 2017 (Wang Han Yang Dashi). Read my review of the Spring 2018 Wenshan Bao Zhong and review of the Spring 2017 Wenshan Bao Zhong. 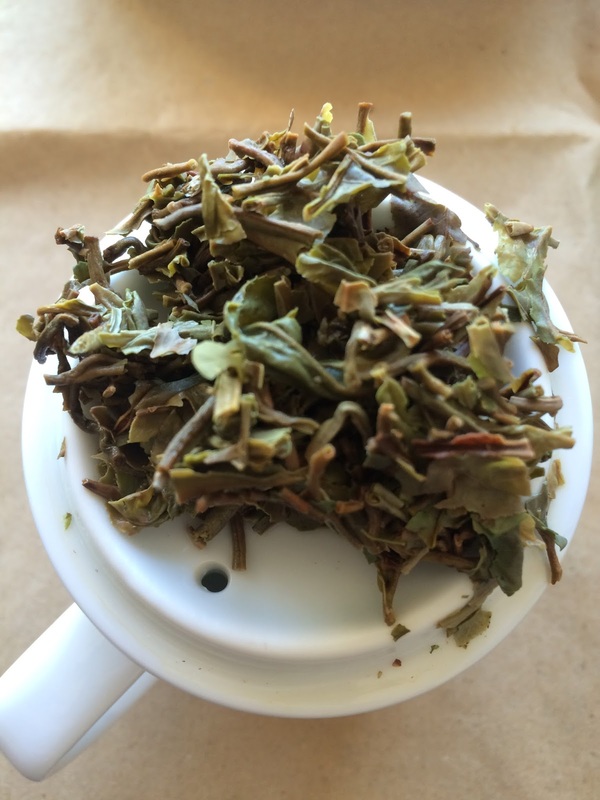 Wenshan Baozhong also known as pouchong is a twisted Taiwanese green oolong. 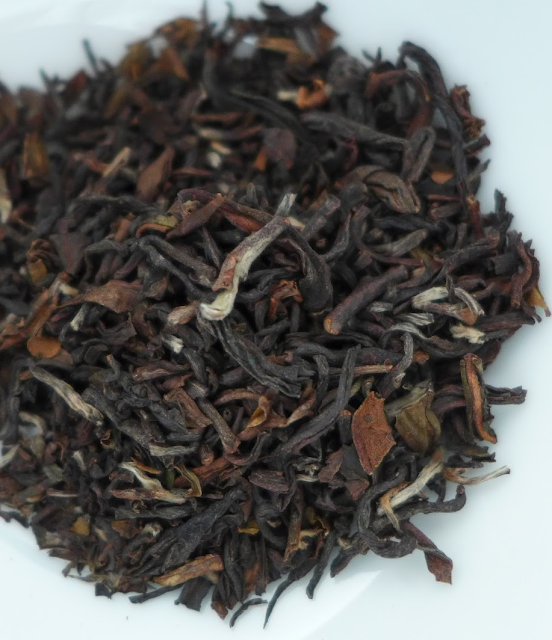 Baozhong teas are lightly oxidized anywhere from 10% to 15%. Their provenance is northern Taiwan in Taipei and Pinglin. The best harvest is spring and the resounding aspect of this tea is its floral aroma. 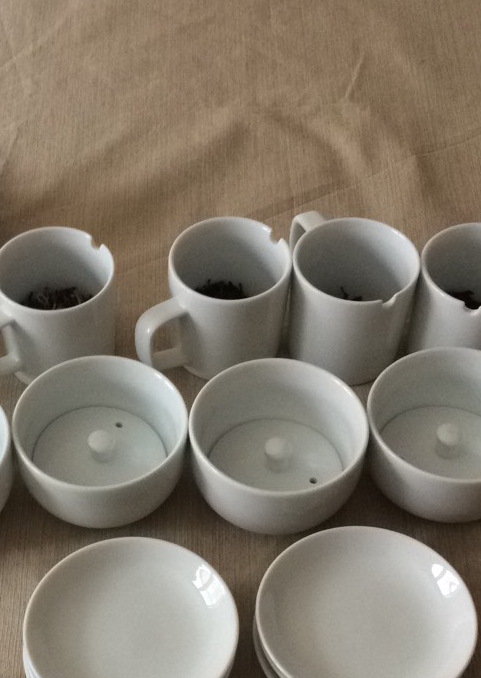 The professional cupping set was designed to compare Indian black teas but it has been used to evaluate similarities and difference among other types and styles of tea. For this tea cupping of oolongs, I steeped 3 grams of tea in 195F water for 3 minutes. After measuring the leaves of each tea, I placed them in the lidded cup then poured hot water to overflowing then replaced the lid. At the end of the steep time, I poured the tea into each drinking cup starting with the first cup to receive hot water. Before I even steeped the leaves I evaluated the dry leaf color and smell. I made notes about color and smell. After pouring the each liquor into its respective drinking cup, one can smell the infused leaves to gauge consistency between these and the dry leaf. I did not. The floral steam coming off the Winter 2018 diverted my attention. Next one evaluates the color and taste of the liquor. You can resteep the leaves by adding 30 seconds to the initial steep time. The second infusion of the Spring 2018 Wenshan Bao Zhong was delightfully floral. I did not evaluate the infused leaves as I was too busy slurping all the cups of oolong. By the time I had turned my attention, and camera, back to the wet leaves much of that immediate sensory information had evaporated. It's definitely worth reading my original reviews of the Spring 2018 Wenshan Bao Zhong and the Spring 2017 Wenshan Bao Zhong. I stored both teas well but their profiles have changed since I first drank them. I enjoyed both teas then and now. However, my favorite of the trio presented here is the Winter 2018 Wenshan Bao Zhong. It's fresh and bursting with classic bao zhong flavors and texture. All three teas in this post were provided by Tillerman Tea for review. The key to drinking shou puerh is to acquire good shou puerh. I do not recommend purchasing your shou puerh from a grocery store. My first experience buying shou puerh was just that. I bought what I now know to be a tuo cha from a well-known grocery chain. Maybe I didn't brew the tea correctly but I'm pretty sure my tasting experience had to do with poor leaf quality. My favorite aromatic qualities in a shou puerh are earth and chocolate. Sweet potato is good. I like a full bodied, inkly liquor. I find it challenging to drink a shou with barn and fungal notes. And if it smells fishy, compost immediately. So, how do I brew puerh tea? I use a gaiwan. I like to use a gaiwan that's anywhere from 100 ml to 150 ml capacity. I actually don't have big gaiwans. I've only been tempted occasionally to invest in a larger capacity gaiwan.Much of the tea I make if for my own consumption so I smaller gaiwan is best. If you don't know the capacity of your gaiwan, fill the gaiwan with water to lid level. Pour that water into a measuring cup to find out your gaiwan volume. Set out the tea and teaware. Weigh your tea based on your gaiwan volume. Boil the water. You want to use 212 F/100 C temperature water to brew shou puerh. Drink then infuse repeatedly gradually increasing the steep time. You could increase the formality of your brewing session by evaluating dry, rinsed, and infused leaves as well as assessing the aromatic qualities of each infusion. 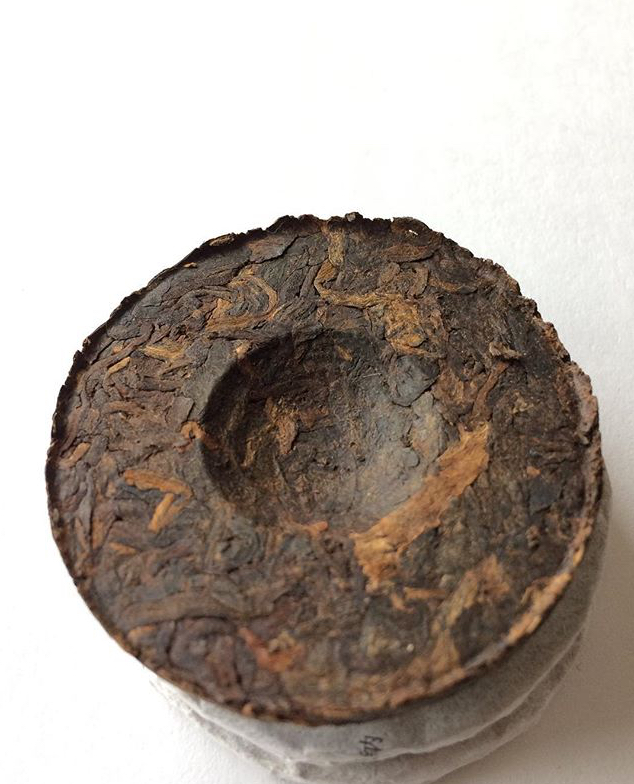 WHAT IS PUERH OR IS IT PUER? What I can definitively is that there are two types of puerh: sheng (aka raw) and shou (aka cooked). The former is a much older production than the latter. 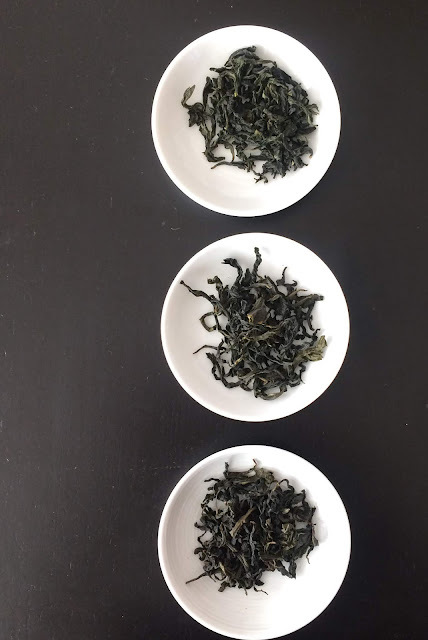 After plucking, both sheng and shou share the following processing steps: withering, panning, rolling, drying, and sorting. A sheng puerh is compressed and dried. A shou puerh is fermented to accelerate the aging process, sorted again, compressed, then aged for a few months. A sheng puerh is more complex for having undergone a much more gradual aging process and it continues to evolve its profile over time. A shou is more-or-less a drink now tea. I mentioned a tuo cha at the start of the post. 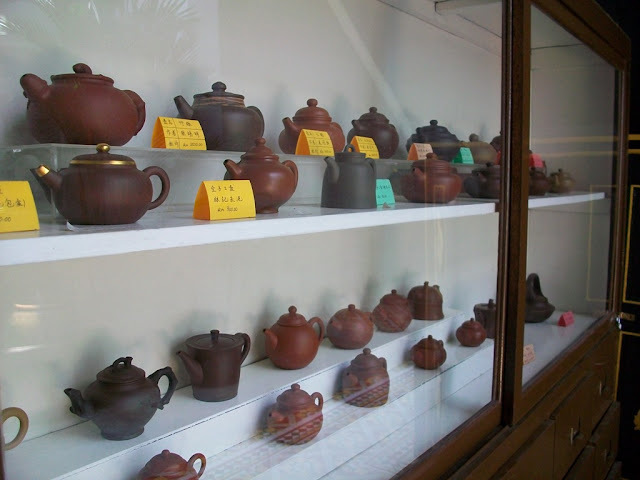 Puerh is compressed into several forms one of which is a tuo cha or nest shape. The typical form is a 357 bing cha or cake. There are also mini cakes (see the first photo). If you want to give shou puerh a try, I highly recommend my current favorite, Trap Bird by White 2 Tea. Let me know your favorite shou puerh in the comments.